The early patch notes for Fortnite update 5.40 are in thanks to a dev update, and the headline news is that the revolver is getting put in the vault. If you’re unfamiliar with the parlance, ‘vaulted’ weapons are removed from the game, but it isn’t necessarily permanent – guided missiles were vaulted and replaced (albeit in altered form). Developer Epic once again makes clear that the revolver could someday return to the fold. Epic say the change is happening to keep the game feeling fresh – apparently ripping up the map every other week isn’t enough. 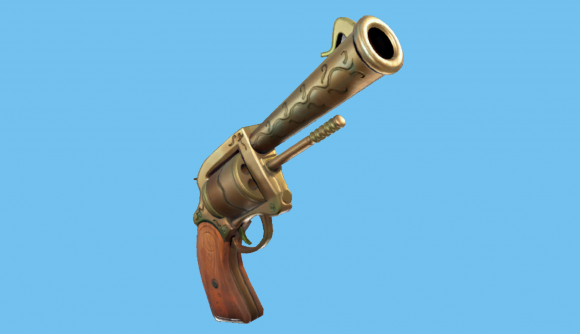 There’s no word yet as to what will replace the revolver – we may get a new pistol or see the return of something like the tactical SMG (though it might be a bit too soon for that). The other key point of patch 5.40 is storm damage – as Eric Williamson explains in the video, the edges of the storm will cause damage to player-built structures in the final stages of the game. Epic reckons this will only affect around 10% of matches, but when it does occur it seems likely to shake things up at the end of a game. And there’s more. Along with new storm damage, players will also be getting a brand new vehicle. Information on what it is is scarce at the moment – but we’re hoping it’s a pimped-out ice cream truck. Naturally we can expect a slew of balance changes to weapons, and also to shields. You’ll be able to carry a stack of three shield potions now (up from two), remote explosives will get a little tougher to find as they’re upgraded from ‘rare’ to ‘epic’, and the Boogie Bomb will now come in twos, meaning there’s a better chance of you dying from the passion of dance – and bullets. You can watch the dev update on YouTube above. In related news, Fortnite’s High Stakes event kicks off next week with a suave new cardshark skin – hit that link for details on the week nine challenges, courtesy of a datamine (and thus being subject to change).